Cast photo by Jeff Yee. 2. 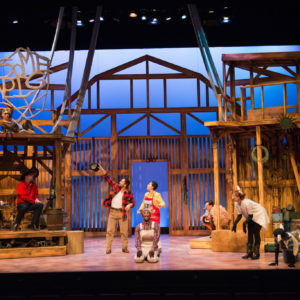 Actor Nadien Chu found inspiration from her grandmother in one of her three roles in ATP’s Charlotte’s Web: playing, alongside Actor Sarah Wheeldon, ‘Grandmother’ characters attending the County Fair! Read more about Nadien’s personal connections to Charlotte’s Web here. 3. 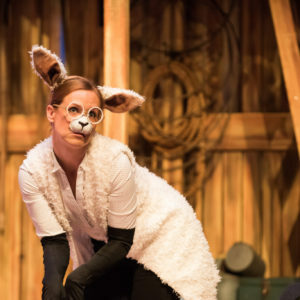 Actor Sarah Wheeldon, playing both Martha Arable and the wise Sheep of the Zuckerman Farm in ATP’s Holiday Show Charlotte’s Web, has also played Charlotte in a previous production of the play. Sarah Wheeldon. Photo: Benjamin Laird. 4. Also a circus artist specializing in silks, Weggsphere, straps and acrobatic dance, Actor and Aerial Movement Creator Léda Davies (currently playing Charlotte in ATP’s Charlotte’s Web) relocated to Montreal in 2013 with the objective of creating new circus acts that integrate multiple disciplines such as theatre and dance. Léda Davies. Photo: Benjamin Laird. 5. 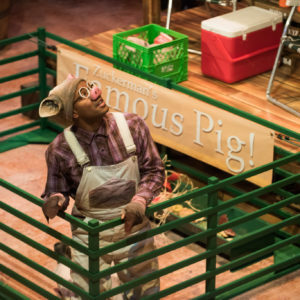 Actor Tenaj Williams, portraying Wilbur in Charlotte’s Web, has starred in a number of Calgary children’s theatre productions including Shrek the Musical, The Little Mermaid, and The Urban Junglebook! Tenaj Williams. Photo: Benjamin Laird. 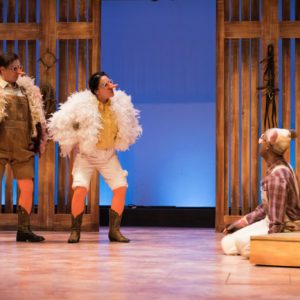 Charlotte’s Web is on in the Martha Cohen Theatre until December 31! Learn more about this special holiday production and purchase tickets HERE.